Jared Tebo’s new driving school, JTU, is prepping for its next class. This time it is moving out of Missouri, and heading south to Amarillo, TX. This class will also be the first JTU for 1/8 scale nitro buggies! Class structure is all about becoming a better driver and learning the secrets from a two time IFMAR World Champion. 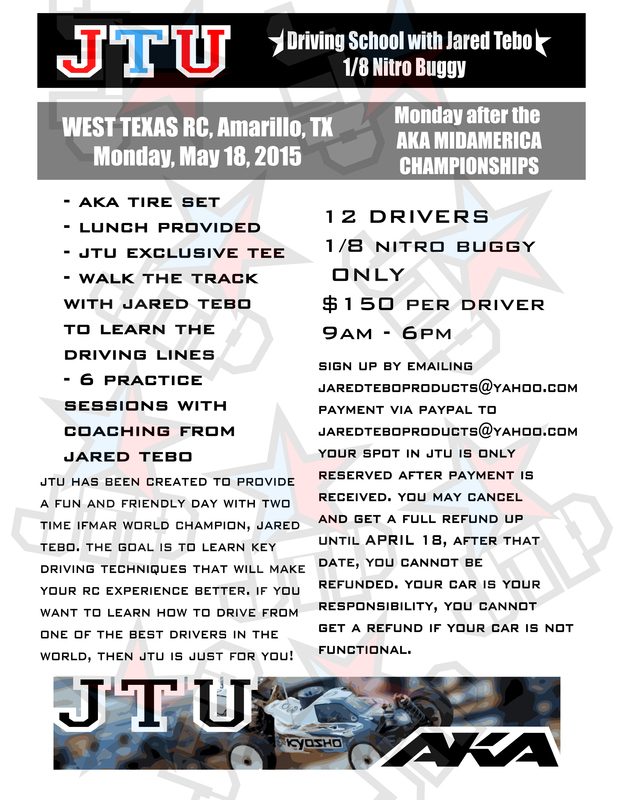 Only 12 drivers will be in the class to maximize the personal feel of JTU. The class will be held on the Monday, May 18, 2015, following the AKA Mid American Championships. I would like to sign up my son Sean Trainer, for the JTU. I thank you, for taking the time to do these classes. Payment is on the way. What body are you running on the mp9 tki3? Is that what you ran in sliver state.